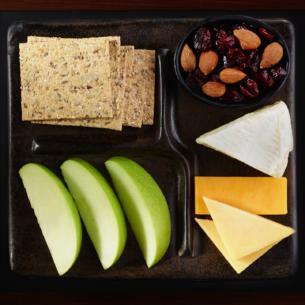 Brie, Gouda, two-year aged Cheddar cheeses, nine-grain crackers, apples, dried cranberries and roasted almonds. apples (apples, calcium ascorbate), brie cheese (pasteurized cow’s milk, cheese cultures, salt, enzymes), multigrain crackers (enriched wheat flour [flour, ascorbic acid, niacin, ferrous sulphate, thiamine mononitrate, riboflavin, folic acid], filtered water, stone ground whole-wheat flour, multigrain mix [cracked wheat, cracked rye, crushed flax seeds, millet meal, cracked triticale, barley grits, sunflower seeds, rolled oats, durum semolina], organic evaporated cane syrup, flax seeds [whole and crushed], durum semolina [semolina, niacin, ferrous sulphate, thiamine mononitrate, riboflavin, folic acid], wheat bran, sunflower seeds, sunflower oil, cracked rye, sea salt, millet), gouda cheese(pasteurized milk, cheese culture, salt, enzymes, annatto [color]), cheddar cheese (pasteurized milk, cheese culture, salt, enzymes, annatto [color]), dried sweetened cranberries (cranberries, sugar, citric acid, sunflower oil, elderberry juice concentrate [color]), almonds. The oldest commercial Cheddar sold in the US was a 15-year old block aged by Hook’s Cheese Company of Mineral Point that sold for $50 per pound.